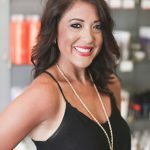 Ashley has been a stylist at Trendsetters for the past year. She specializes in formal up-dos, men’s cutting, and highlighting. Outside of work, Ashley enjoys hiking, kayaking, and spending time with her dog, Theo.